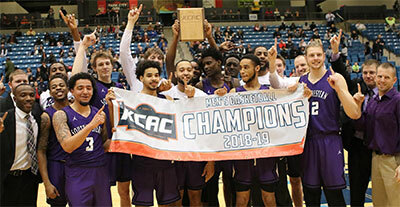 The Southwestern College men's basketball team was crowned KCAC Tournament champions Monday night after defeating the No. 1 seed and No. 1 nationally ranked Oklahoma Wesleyan Eagles 78-75 from inside Hartman Arena. After splitting the first two meetings by a combined six points, the rubber match was everything everyone anticipated- beginning with high energy and back-and-forth play and ending with loads of drama and clutch performances. The game started out with the Builders jumping to a nine-point lead, getting baskets from three different players to begin the contest. Just like they did all year though, the Eagles stormed back to regain control of things and would eventually go into halftime with a two-point lead. Despite trailing 36-34 at the break, the Builders had to be more than thrilled they were down just two points as the team shot 35 percent compared to the Eagles' 45 and connected on just 4/19 shots from behind the arc. The only thing keeping them in the game at that point was their work on the glass, doubling up Oklahoma Wesleyan 24-12 in the rebounding category. Cameron Hunt (6'5''-G) (SR/Duncanville, Texas), who had a near triple double and 40 points the last time these two teams met, was just 3-15 shooting the ball in the first 20 minutes- good for 11 points. The second half started off slower than the beginning of the game, with both teams struggling to take control and really put themselves ahead. The Eagles did not go without the opportunity as their biggest lead of the game came early in the second,holding a five-point advantage and possession of the ball. The Builders were able to make consecutive and timely stops on defense and get back in front, with the lead for either team going no more than four points until the final minute. In the team's first matchup in Bartlesville, Southwestern's Jarehn White (5'10''-PG) (JR/Converse, Texas) was a major factor down the stretch- hitting a three-pointer with just seconds remaining to put the game out of reach in favor of the Builders. On Monday, White was just as clutch as a three-pointer in almost the same spot as previously noted extended a one-point advantage to four with two minutes to go in the game. White finished with nine points off the bench. From there, the Builders responded to every Oklahoma Wesleyan answer with one of their own as the team's final six points came from the free throw line, going 6-6 to close out the game. The Eagles had one final shot and Southwestern fans almost experienced deja vu with the Eagles' Brooks Haddock- who hit a game-tying three at the buzzer in Winfield. Haddock had two looks at a three in the final seconds, eventually coming up short on his last second heave. The ball would land in the hands of Hunt as he dribbled out the remaining seconds for a Moundbuilders KCAC Tournament title. Hunt overcame his slow start to finish with 29 points and 12 rebounds, while Simpson Anderson (SR/Baton Rouge, La.) connected on 15 points and five assists. The Builders outrebounded the Eagles, who lead the conference in total boards per game, by five, and were a perfect 17-17 from the free throw line. Due to Oklahoma Wesleyan, the regular season conference champions, making the title game, the Builders by rule have already clinched an automatic bid in the NAIA national tournament.